Charles Allen - Oklahoma State University and Texas Tech University; He was the first Chairman of the AAA Research Committee and conducted two of the earliest studies on advertising education. Arnold Barban - Professor and Head of Advertising departments at University of Illinois and University of Alabama; President of AAA. Don Belding - V-P, Lord & Thomas; Founder of Foote, Cone & Belding; Founder of War Advertising Council; directed Smoky Bear’s “Only YOU can prevent forest fires;” American Advertising Federation Hall of Fame. Sidney R. Bernstein - Senior editor, Advertising Age; defender and supporter of advertising education, attending and participating in all AAA conferences for many years, chastising business press for their failures to report on AAA or advertising education. Steuart H. Britt - Northwestern University, one of first psychologists to hold positions in both marketing and advertising departments; author of first consumer behavior textbook; a star in socio-psychological research. Philip W. Burton - Advertising Departments chair at Universities of Iowa and Syracuse; Advertising Federation of America Director; first Distinguished Advertising Educator named by the American Advertising Federation. Les Carlson - Professor and holder of the Nathan Gold Distinguished Professorship in Marketing at the University of Nebraska. Past President and Treasurer of AAA and former editor of the Journal of Advertising; recipient of the AAA Outstanding Contribution to Research Award and the AAA Kim Rotzoll Award for Advertising Ethics and Social Responsibility. John Crawford - Advertising Department Chair at Michigan State University; AAA president; first Chair of the Advertising Division of the Association for Education in Journalism and Mass Communication. Barton Cummings - Compton Advertising CEO, chairman of the executive committee; chairman emeritus of Saatchi & Saatchi; chairman of the American Association of Advertising Agencies. S. Watson Dunn - Professor and second Head of Advertising Department after Sandage retirement, University of Illinois at Urbana-Champaign; first advertising graduate of doctoral communications program at UIUC; president of AAA. James S. Fish - Advertising director at General Mills; faculty at University of St. Thomas; American Advertising Federation Hall of Fame; Facilitated merger of the Advertising Association of the West and Advertising Federation of America. Vernon Fryburger - Northwestern University; seventh President of the AAA. Stephen A. Greyser - Professor, Harvard University; President of AAA. Melvin S. Hattwick - Advertising director of Conoco Oil Company; Advertising Federation of America president & important supporter for establishment of the AAA. Colorado State University faculty. Harry Hepner - Syracuse University; Founder, first President, and first Fellow of the AAA. Don Hileman - Head of advertising programs at Southern Illinois University and University of Tennessee; ADS’ Golden Fifty Awards for advertising educators. H. Keith Hunt - Brigham Young University; President and first Executive Secretary of AAA; Journal of Advertising editor. Donald W. Jugenheimer - President and Executive Director, AAA. Head of a plethora of advertising programs and author of many advertising books. John D. Leckenby - Professor of Advertising, University of Illinois and University of Texas; President of AAA; third recipient of Outstanding Contribution to Research award; leading researcher on advertising media; mentor to a plethora of doctoral students from around the globe. Claude R. Martin, Jr. - Head of Marketing Department, University of Michigan; creator and long-time co-editor of Journal of Current Issues and Research in Advertising. Gordon Miracle - Former Head of Advertising department, Michigan State University. Joseph Phelps - Chair of Advertising Department, University of Alabama; President of AAA. Ivan L. Preston - Professor, University of Wisconsin-Madison; President of AAA; second recipient of Outstanding Contribution to Research Award which was posthumously named after him 20 years later; second recipient of Kim Rotzoll Award for ethics and social responsibility; Author of seminal books at advertising regulation that were influential to laws, regulations, and the Uniform Commercial Code. Royal Ray - Chair of advertising program at Florida State University; fourth President of AAA. Leonard Reid - Head of Advertising Department, University of Georgia; Editor of Journal of Advertising. Jef I. Richards - Chair of Advertising Programs at University of Texas and Michigan State University; President of AAA; Outstanding Contribution to Research Award; co-editor with Billy Ross of updates to a directory of advertising programs; AAA historian and conference photographer. Billy I. Ross - Louisiana State University and Texas Tech University; founder and second president of the AAA; president of the Lubbock Advertising Federation; creator and continuing editor of compendia of advertising/PR programs. Herbert Jack Rotfeld - Auburn University; President of AAA, lead acquisition of Journal of Current Issues & Research in Advertising with new business model; editor of Journal of Consumer Affairs; Outstanding Contribution to Research Award; third recipient of Rotzoll Award for ethics and social responsibility. Kim B. Rotzoll - Professor and Head of Advertising Department at University of Illinois at Urbana-Champaign; President of AAA; posthumously an award for ethics and social responsibility was created in his name with him as first honoree. Charles H. Sandage - The “father of advertising education;” Head of Advertising Department, University of Illinois; Founder/Creator of first Department of Advertising; creator of first scholarship fund for graduate study of advertising; Founder of AAA; American Advertising Federation Hall of Fame; Printer’s Ink Gold Medal Award. Jack Z. Sissors - Northwestern University. Esther Thorson - University of Wisconsin-Madison, University of Missouri and Michigan State University. 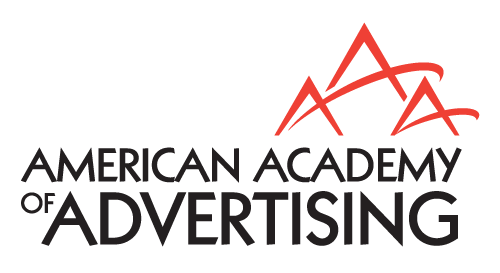 American Advertising Federation’s Distinguished Advertising Education Award, the American Academy of Advertising’s Outstanding Contribution to Research Award, a Mizzou Alumni Association Faculty Award and the Missouri Curator’s Award for Scholarly Excellence. Daniel Warner - University of Washington; third President of the AAA. Walter Weir - A well-known copywriter and agency executive who, when retired, became a professor at Tennessee and Temple Universities. American Advertising Federation Distinguished Advertising Educator award. Gordon White - long-time Creative Director at BBDO; Professor, University of Illinois; fostered many long-time contacts between AAA and advertising agencies. Robert Zacher - Arizona State University; the fifth President of the AAA; Chair of the Advertising Division of the Association for Education in Journalism and Mass Communication.